And so it goes, I figure I better write this down before I forget. Then, after racing last year I ended up sidelined with a torn TFL/ ITB and was out for a good bit. And when I say out, I mean out. No swim, No Bike, No Run. Luckily, I had a coach and friend who believed in me and ignored my efforts to throw in the towel before I even started. My training slowly built back up after I convinced myself that I was OK and raced on a tough day in June in Raleigh. I think I came away with that race feeling pretty strong, but still unsure what I had truly gotten myself into. The summer, as I am sure anyone reading this report can relate to, was brutal. Like swerving off Hadley Fairy/ CR 12, wanting to call an ambulance, nauseated, wondering what the hell I am doing brutal. I had a few days here and there that inspired me to keep going– but mostly days of why???? Somehow I got to taper still in one piece and was kept busy or tired enough not to even realize I was resting and found myself packing for the race. I am a bit superstitious, so while 2000 athletes booked their hotel rooms in Chattanooga months ago, I waited until August. Wayne was able to get a room at the Doubletree and then 2 weeks before the race I cancelled that and found a room at The Residence Inn about 2 minutes from transition. Priced like the Plaza on NYE and designed more like a Holiday Inn, it was close to everything and worth the balance in my opinion. Had I had planned better I could have taken advantage of the kitchen in the suite- but none the less, they did have free breakfast with a waffle machine and an awesome lady willing to make me as many yogurt parfaits as I wanted! The days before the race Thursday- Saturday went by fast. It rained non stop, which I feel kept most people in their hotel rooms. Check in was a breeze- 10 minutes door to door on Friday morning- and the rain was a great excuse to get off the feet and hit the movie theatre 1 block away. A couple of good meals, a bit of race recon, pre- race dinner with inspiring friends and it was lights out. I slept not a wink. Race morning came and I was already awake- showering before an Ironman seems ridiculous, but I wasn’t sure what else to do. No sleep and days and days on Nuun on top on Nuun on top of Nuun had definitely left its mark as I looked in the mirror, all I could do was hope. Hope for the best, but be ready for the worst. That line moved fast. there was no hesitation, no time to back out- it was walk the plank jump in and go. Even for being far back in line the clock read 7:40, 10 past the start when I went under the swim start sign. Unless you are trying to win, I think sleep beats out a 10 minute head start into T1. I did not grow up a swimmer- This swim was fast. Even without a wetsuit I averaged faster than my TT pace for 2000 in a pool. I knew that the difference time wise for my “hard” swim and my “easy” swim was not likely to be more than 10 or so minutes, so I counted my strokes– 1,2,3,10- damn, I mean 1,2,3,4 start over and tried really hard to concentrate on form. I basically swam alone. Probably not the most direct route, but out wide and by the island, where my trusty husband said the current would be fastest. The buoys were lined up really nicely to my left- easy to see- 10 yellow ones, 9 big orange ones, small orange ones in between and a red one to finish. Wayne had raced this last year and told me to sight off “the” white boat.. and that I should be close to the shore, away from the island side as I started going under the first or second of the 3 bridges. I aimed that way and before I knew it I was caught in a mass-looking for the stairs. I trained for hills. I spent months riding CR12 and TS Greene and Monticello. I knew what my body was capable of, I knew the power I could hold alone on those hills and the speed it would produce in Tallahassee. I had a plan, and I knew a lot of people would be passing me. But hey, I am used to that. 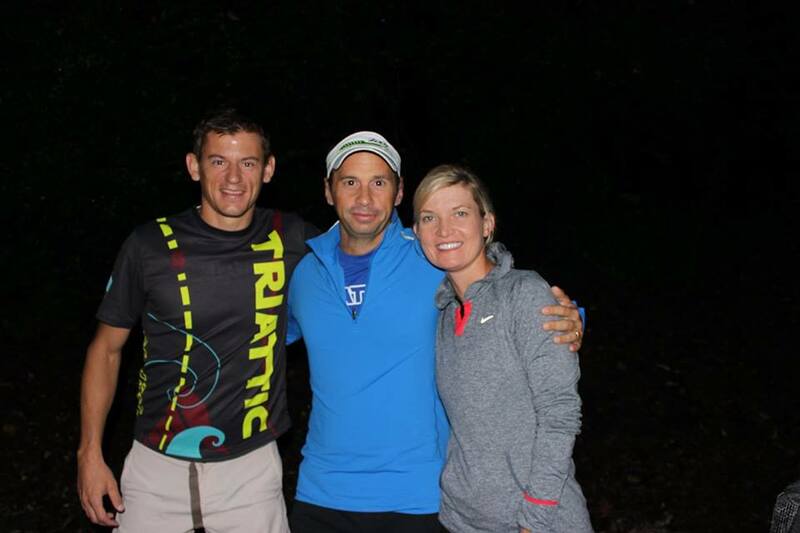 And as super Ironman mentor Sandy said, let them go – you know you will see them on the run. So all day long I rode within myself. There were 10 or so miles out-of-town which were crowded and bumpy- a lot of loose bottles – similar to watching kids ski — all I could think was “yard sale”. There were a few train tracks and basically annoying roads. I had mentally marked the second Dollar General as a landmark- this was the point where it became more of a ride than an obstacle course. Next up was 2 loops around this lollipop, the first side hilly the back side fast. I was continuously passed. For what its worth, I feel like I ride differently than 80% of the people out there. I don’t push the hills- I sit up and try to keep the power as low as possible and then pedal through the crest and down hill. My power meter failed me at 4.5 hours, so I am not sure exactly where I leveled out at, but I rode a the same speed that I rode my “hilly” training rides at all summer. I feel like this bike may be a bit deceptively fast- and that perhaps a bit of a push here may show itself exponentially on the marathon. I only say this based on the number of people I heard talking about their bike splits on the run? The ride kept me busy. There wasn’t time to get distracted or sloppy and when I did I paid- as evidenced by dropped chain x’s a few. The uphills were punchy, but the down hills, especially the one after Chickamuagua was worth every second. 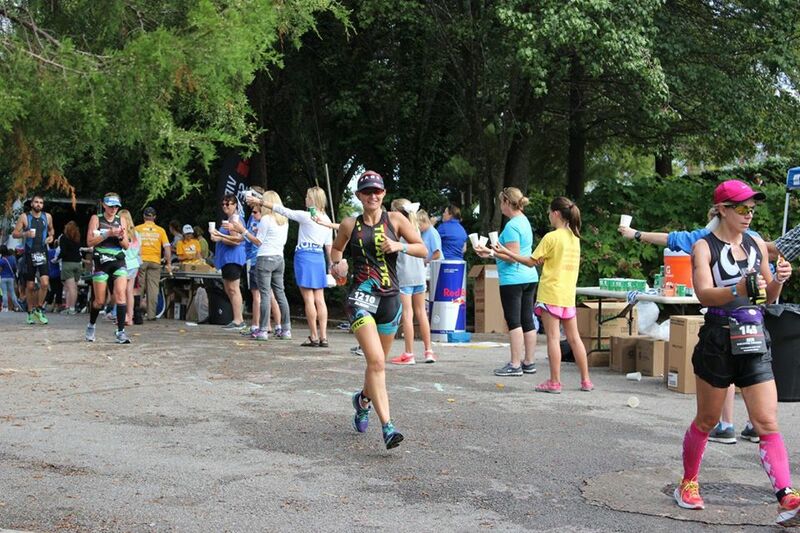 At mile 80, I knew that only had a Olympic distance left and at a MUCH easier effort and I felt strong still. Before I knew it I was back at T2 and looking forward to handing my bike off- that could be the best part of ironman. My nutrition on the bike was insane- 4 stinger waffles, 1.5 packs of shot blocks, 2 bottles of base rocket fuel ( 270 kcal/ piece) , 2 bottles of Gatorade endurance and water as needed. 1780 kcal- or 273 kcal/ hr…perhaps too much- but if nothing else I have a strong gut. I love running. This summer coach Charlie taught me that slow was indeed the new fast. I blew up on more than a couple of long runs, but eventually I think I finally learned what running easy really feel like- something that has always evaded me- If “if it doesn’t hurt you must not be trying” is a mindset I have embraced much of my life. I set out to run 30 minute 5 ks. Something I felt I should be able to do on an easy day. When my heart rate monitor failed, I knew it didn’t matter- my legs always limit me before my heart. So one 5 k at a time I clicked them off. I made walking the uphills part of my strategy- I realized in Raleigh that my uphill power walking pace wasn’t much slower than my uphill running pace- and I was able to accelerate down the hills and on the flats. The one thing I wish I would have done during training was to run faster down more hills… As fast as I can down hill run training. My quads might not feel so bad right now. The aid stations were every mile and they were awesome. I survived off Gatorade, water, coke and redbull- Thanks to my BUFFET style eating on the bike. I loved the marching band and the fact they they played “hang on sloopy” it was almost like my dad was there. The last 2 miles were rough and I was starting to slow down- duh! But, as I crossed the bridge and had some random guy yell Go TirARTICA, I had to laugh- he was definitely going to remember this less than I was. I rounded the corner to the finish and Charlie told me pace didn’t matter-he said to take it all in- so I did my best to look around and see the moment for what it was. Looking at the big picture always provides a much better view. 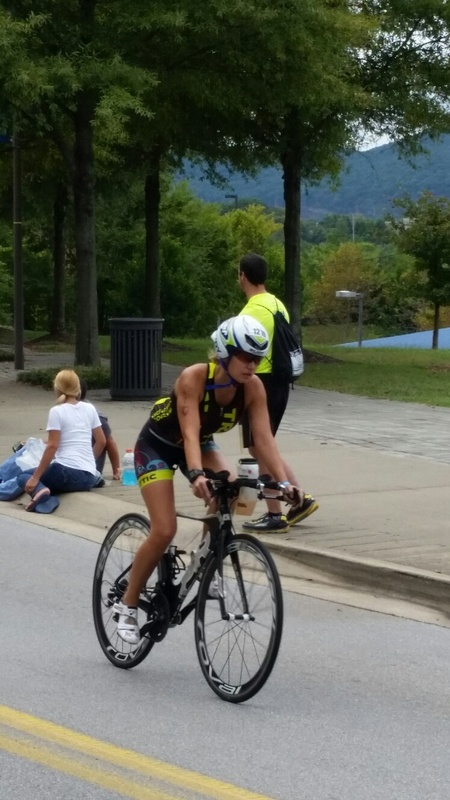 Alison Thumm is a registered nurse anesthetist by day, mother of two round the clock, and an age group triathlete always striving to be her best self. 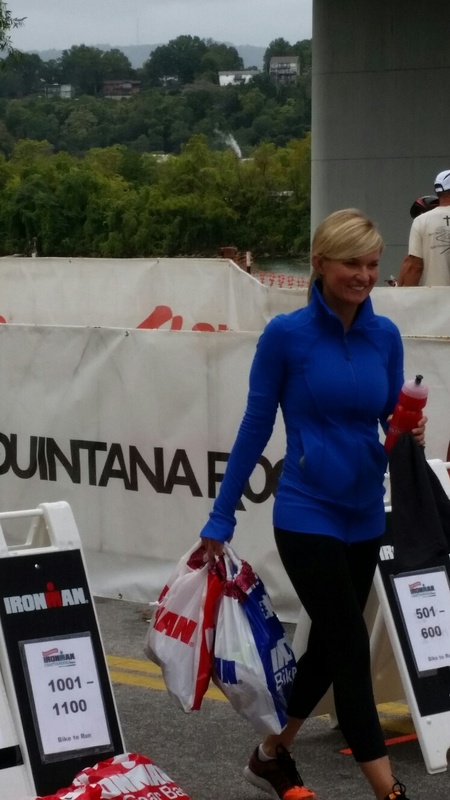 Great race report, Alison, er, I mean, IRONMAN!